In honor of the fiftieth anniversary of Robert Francis Kennedy’s death, an inspiring collection of his most famous speeches accompanied by commentary from notable historians and public figures. Twenty-five years after Bobby Kennedy was assassinated, RFK: His Words for Our Times, a celebration of Kennedy’s life and legacy, was published to enormous acclaim. Now, a quarter century later, this classic volume has been thoroughly edited and updated. Through his own words we get a direct and intimate perspective on Kennedy’s views on civil rights, social justice, the war in Vietnam, foreign policy, the desirability of peace, the need to eliminate poverty, and the role of hope in American politics. Here, too, is evidence of the impact of those he knew and worked with, including his brother John F. Kennedy, Lyndon Johnson, Martin Luther King, Jr., and Cesar Chavez, among others. 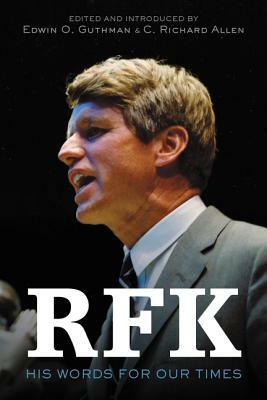 The tightly curated collection also includes commentary about RFK’s legacy from major historians and public figures, among them Barack Obama, Bill Clinton, Eric Garcetti, William Manchester, Elie Wiesel, and Desmond Tutu. Assembled with the full cooperation of the Kennedy family, RFK: His Words for Our Times is a potent reminder of Robert Kennedy’s ability to imagine a greater America—a faith and vision we could use today. Robert F. Kennedy was one of the best-known political figures during the 1960’s, globally admired for his personal toughness, and passionate advocacy on behalf of civil rights, economic opportunity, and peace. He ran his brother John’s successful campaign for the US Presidency in 1960, and then became the nation’s second-youngest Attorney General. After a successful New York run for the US Senate, he pursued the Democratic presidential nomination in 1968. He was assassinated in June of that year, at age 42. Rick Allen is a media and technology executive and has been a speechwriter, fundraiser, and state campaign manager for several presidential and Senate candidates. He also served as Deputy Assistant to President Clinton, helping to create AmeriCorps.